As New York mobster stories go, there seemed to be no shortage in 2011. Mob expert Jerry Capeci should know. Capeci, a former New York Daily News reporter, runs the website Gang Land News. On Thursday, he picked the top mob stories of 2011. 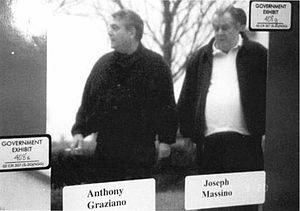 Runner up story, Capeci writes, was the appearance in April in fed court in Brooklyn of ex-Bonanno boss Joseph Massino on the witness stand at the capital murder trial of successor boss Vincent (Vinny Gorgeous) Basciano. Massino made history, becoming the first mob boss from one of the 5 New York crime families to take the witness stand for the feds. Though Capeci picks the massive takedown in January as the top mob story of the year, he is not without some skepticism.